Getting engaged was one of the most gorgeous times in my life. We could literally see and feel the good energy around us. Not to get all The Secret about it, but it was like every person we met was just so lovely to us, because we were [are still] so happy. We rode that wave for about a month, not thinking about anyone or anything other than ourselves and how deadly it felt, finally being engaged to my long-term love. I decided to pop the bridesmaid question the night of our engagement party, complete with personalised gifts and blooms. For me it wasn’t an overly difficult task - my sister was always going to be my maid of honour, my best friend my bridesmaid and my fiancé’s sister too. I’m lucky I have a very close bond with my SO’s family, so it wasn’t a question of duty, just a natural choice. However, there was one other friend I wish I could have asked. It really cut me up for the weeks leading up to our engagement party. She’s one of my closest and oldest friends and I felt so bad I couldn’t ask her. Three for me is the absolute maximum, given we’re only short of eloping and won’t be having a big wedding. For us, any more than that, felt out of sync with the intimacy of what we would like. Think long and hard about your wedding and the size of what you will plan. Trust me, I know how hard it can be trying to whittle down through besties, but you have to be ruthless. 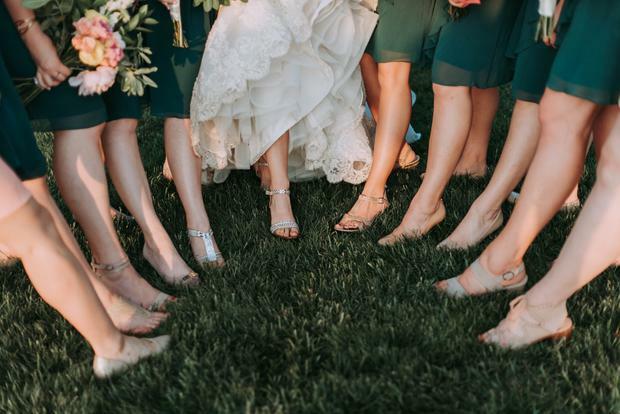 Six bridesmaids jammed into a registry office isn’t going to work and your groom’s number will also play a part in balancing out the photos, first dances and budget. Sure your best mate Gill has seen you through all the crap partners and is always there with a vino in hand and a compassionate ear; but if she’s the biggest, albeit most loveable flake, chances are you’re going to be left stressed, hurt and questioning your friendship. Choose your ride or dies of course, just ones with a penchant for a Paperchase diary and good timekeeping. Gone are the days when your bridal party had to be all women. If your bestie is a guy and you’d like him by your side- do it. Plenty of weddings have mixed bridal and groom parties and it’s about who you want to be there in the run up, offering their help and support. It really shouldn’t matter if your granny doesn’t get it; it’s your big day, so be true to yourselves. Fickleness or spur of the moment prosecco chats, are no place to declare your love for the squad and tell them they’ll be in your wedding. It’s totally normal to get carried away in the excitement of it all, especially after a few drinks. Proceed with caution or you could end up having an old work friend teeter off to her Hailo thinking ‘’who knew we were so close?’’. It’s a conversation that should be discussed and agreed with your partner before you start raiding Etsy for keepsakes. As soon as you’ve asked, you really can’t take it back, so think carefully about who you want to have immortalised in your wedding album.